I’m determined to get this particular top done in four weeks of serious working, so I devoted a lot of time to getting these strings blocks finished. Made them them into 64 half square triangle blocks (as shown the last two Mondays). Made them into four more rows of 16 blocks each. Added those rows to the center part which was already made. I am now 3/4 finished with the top. I have 12 of the 16 rows needed all finished. Once again, I’m delighted with it. I am actually surprised how much I like it. Shocked, if I can say so. You could try one - even if you are like me - a person who isn’t crazy about strings. Just possibly you will start liking them! (But only if you want to.) I’m not here to try to put another project on your plate! Most of us are going at full throttle with regards to quilting and other things in our lives! Just remember - use your darker or more saturated fabrics for the best contrast. I have thrown some with a bit of white in the blocks, but have tried to keep them to a minimum for the most impact of color! And that is my strings report for this weekend! I’m glad I’m trying to keep these things to weekends only - as while I love the look of strings in a finished quilt, I also do get tired of making them! I think at that point it is time for me to go and work on some nice piecing project! 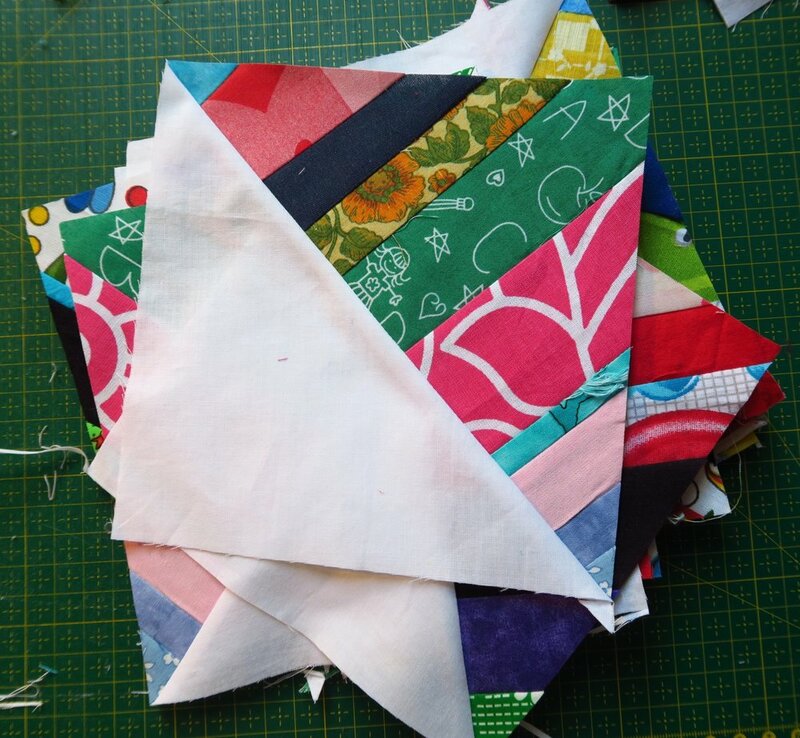 Piecing is my favorite part of this whole quilting process! I think if you’ve been reading me much at all, you’ve probably got that figured out! Right? And that’s what I’ve been up to this weekend with regards to this particular quilting project! Be sure to check out what my sis has for you over in the store. She’s always trying to get you something new at a great price!